Autodesk has announced that it completed the acquisition of technology and the development team of Belgium-based Circuits.io, a web-based app and connected community for designing and simulating electronic circuits. 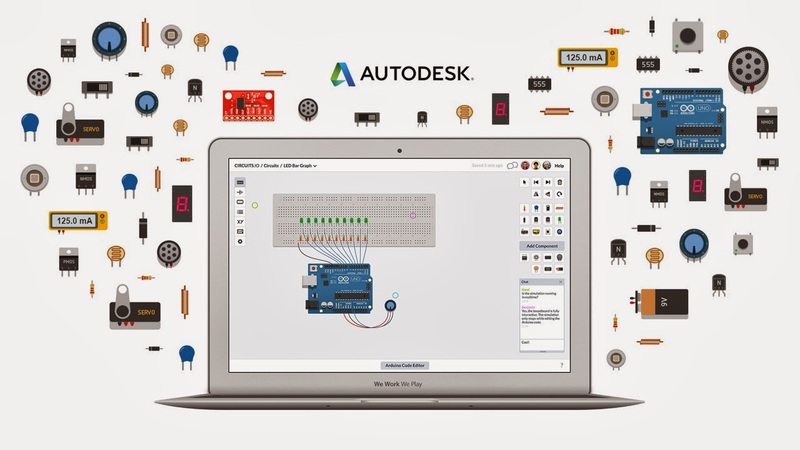 Autodesk partnered with the Circuits.io team in September to introduce Autodesk 123D Circuits. Autodesk said it intends to expand its offering of technology for electronic circuit design and simulation. Financial details weren’t disclosed. The acquisition also includes key Circuits.io contractor We Work We Play, also based in Belgium. 123D Circuits expanded on the existing Circuits.io app by adding a breadboard view and let users run code and simulate circuits in the app. Users can create projects ranging from simple, blinking LED to the autopilot circuitry for flying drones. Users have the ability to share circuits with the community and to start new projects based on a circuit created by other members of the community. Custom circuit boards designed in the app can be manufactured and shipped to users. As part of the acquisition, Autodesk plans to migrate all Circuits.io accounts to 123D accounts, and both Maker and Professional level members will receive 123D Premium membership as part of this migration. Since the launch, the 123D Circuits community has grown to more than 30,000 users.